Sunday April 19, 2020 11:00 p.m. - 3:00 p.m. Either in uniform or with scout identification. "Taking pictures and video is encouraged in the competition room. Please note that photographs, and video and audio recording devices are prohibited during the Mattel presentation and during the viewing of any other movies, slide presentations or live entertainment. 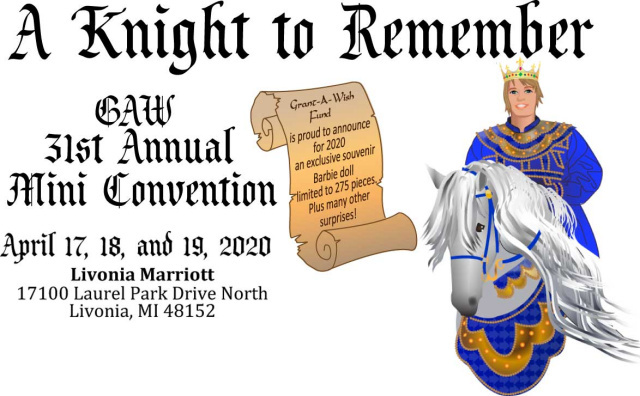 All pictures, video or audio recordings of the Convention are for your personal and private use only, and may not be otherwise shown publicly or offered for sale. Your entry into the Convention shall constitute your agreement and acceptance of these terms"
BARBIE and associated trademarks and trade dress are owned by, and used under license from Mattel, Inc. © 2009 Mattel, Inc. All Rights Reserved. This convention is not sponsored by, or affiliated with Mattel, Inc. Copyright 2009. Grant-A-Wish-Fund. All rights reserved.